Dolan Avenue from the church. Heading either North or South on US Highway 101 toward San Mateo, take the 3rd Ave. exit East (toward the Bay). Note that 3rd Ave. is about 1 mile North of the 101-92 freeway interchange. Once Eastbound on 3rd Ave., merge to the left lane and prepare to turn left. Do not be alarmed to find yourself on J Hart Clinton Dr. since 3rd Ave. changes to this name near the Church. 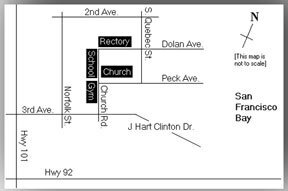 Weekends: On weekends, it is possible to make a left turn from 3rd Ave. directly into the Church parking lot. Immediately after crossing Norfolk St., you will see a left turn lane and stoplight at Church Rd. to assist you in making a turn into the parking area. Weekdays: When school is in session, a different route is required. From Eastbound 3rd Ave., turn left at Norfolk St. Turn right on 2nd Ave., right on S. Quebec St., right on Dolan Ave., and right into parking lot.